Footage of everyday American city life rolls over a monologue by journalist Chris Hedges. Girls dancing in line at a nightclub, a street performer suiting up for his show, a mangled pigeon dead on the sidewalk. Americans are selfie-ing, dancing, and commuting while alarming headlines about our new government scroll around them in Times Square. This is the American Psychosis—a state of sly oppression where spectacle and daily pleasures appease the general public despite rapid and regressive government activity. Social and environmental policies and agreements are rolled back in the name of greatness. American Psychosis, a short film by Amanda Zackem shown during the Telluride stop of the world tour of Mountainfilm, illustrates an element of the festival’s 2017 socio-environmental theme: The New Normal. 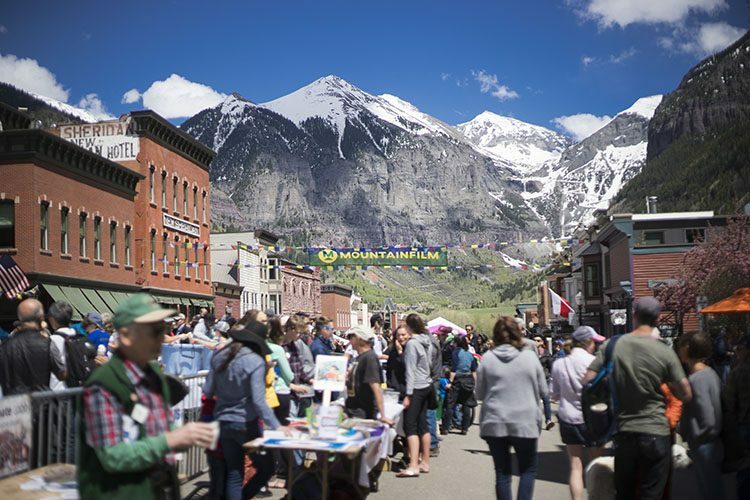 A timely topic, the New Normal theme focused on climate change and life today, bringing together researchers, activists, filmmakers and their audiences to Telluride over Memorial Day weekend. What was expressed in the presentations and films was recognition that the road to sustainability is long and steep, but still we continue forward. The New Normal represents resilience, activism, and the rejection of passivity in climate conservation. The festival began with a TED-like symposium featuring presentations from scientists and researchers alike. Guests came from all around the country, roughly two percent of attendees traveling from other countries. Total attendees was expected to surpass last year’s 4,000. 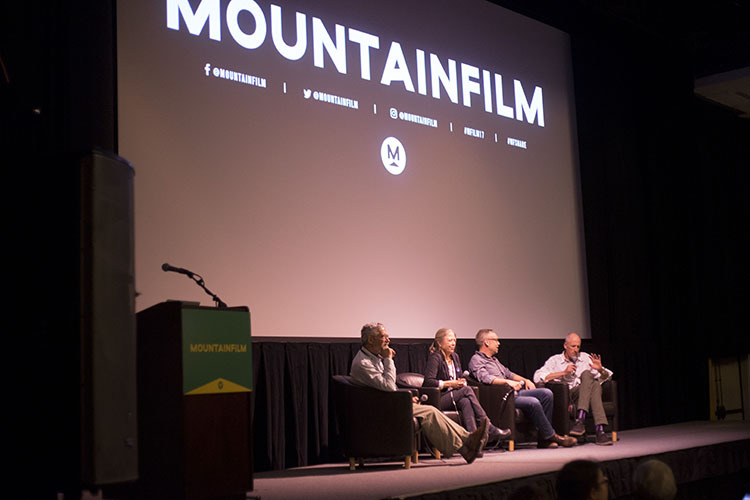 Mountainfilm’s overarching goal was to engage the community toward carbon neutrality, not only for the town of Telluride but as a global standard. 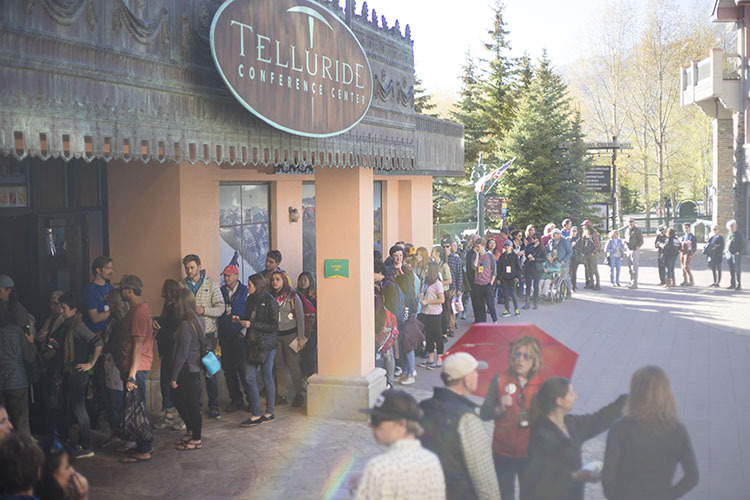 Telluride implemented several strategies for carbon neutrality at the festival. Attendees were encouraged to carpool to the fest, could purchase carbon offsets for their travel, and were encouraged to download the festival app instead of seeking paper programs. Presentations from esteemed researchers and scientists brought the festival’s initiatives full circle. Among the panel of scientists and researchers at the Moving Mountains symposium was Drew Jones, Co-Director of Climate Interactive. Jones presented a strong case for hope in the environmental movement. “Hope is a choice to be a part of making change,” he said, explaining that social movements endure long periods of little progress, and then boom, progressive policy rapidly gains momentum. “What if we’re right before a boom?” But what we need as much as activism is youth education, John Holdren, Obama’s chief science & technology adviser added, stressing the importance of engaging our youth in this ongoing challenge. This year’s films indulged audiences in unique perspectives on climate change. Several big name productions appeared at the festival, including Chasing Coral, a sister production of Chasing Ice, and Patagonia’s Fishpeople. These films among many others combined artistry and culture with science. However, the dialogue in these films is no longer about preventing climate change, it’s now about adapting to its consequences and mitigating further effects. Learn more about Mountainfilm festival and keep up with the world tour at mountainfilm.org.